There's mounting evidence that practicing meditation provides a broad range of benefits. If you practice meditation regularly over time, you'll reap the rewards of an inner calmness that won't be easily shaken by minor mishaps in daily life. Best of all, you can start meditating today for free with no special equipment. When you feel like you're about to boil over, try putting that feeling into words. If one of the words that comes to mind is "should" or "ought to," you may be demanding too much from the situation or placing the blame on someone else. Rather than test your patience by defining situations with "should" or "ought to," try building patience by thinking in terms of "could." Consider the other possibilities you could pursue in an effort to solve the problem or work through a challenge. In other words, focus on the things you can control rather than on the things or people you can't. Sometimes the best way to deal with frustrating situations is to focus on something other than your brewing irritation. Play a game of mental scavenger hunt using your surroundings. For example, if you're bumper-to-bumper in a traffic jam, rearrange the letters and numbers of the license plates around you to make funny words or phrases (this game also helps distract irritable kids). If you're stuck in a long line at the grocery store, discretely review the food selections of the person in front of you. Can you tell what's on their dinner menu? What could you make with the same ingredients? Not getting enough good quality sleep keeps us on edge and makes us more susceptible to losing our cool. Fortify your patience by giving yourself the advantage of a good night's rest that is built around at least seven hours of uninterrupted sleep. Since gratitude can improve our health, practice thankfulness to counter negative moods and impatience. The next time something isn't going your way, try to recall and be thankful for all the times things have gone right in the past. You might even find yourself being grateful for the opportunity to meet the challenge at hand! Exercise your patience muscles with hobbies that build results over time. Knitting, painting, sculpture, and bonsai are relatively inexpensive ways to explore your creative side and build patience and mindfulness. As a bonus, practicing these crafts will likely result in beautiful object or two. You might even make a family heirloom in the process of becoming more patient. Need to de-stress now and don't have a slow hobby at the ready? Try these 20 inexpensive ways to relieve stress and live in the moment. It's easier to live with feelings of discomfort if you can convince yourself that it's for a good cause. When you get impatient, reconnect yourself with the motives that put you in the situation. If you think those motives are worthy enough, then try embracing the discomfort as a small price to pay for a larger reward. Cultivating patience is a process — one that isn't reinforced very often by our hectic world and 24/7/365 lifestyles. But even though patience may be hard to come by these days, it's certainly worth pursuing. 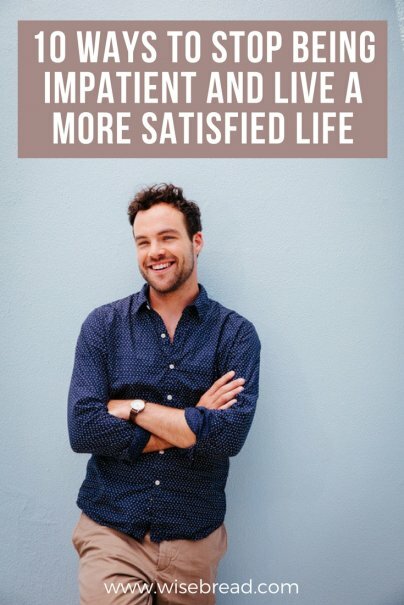 And the rewards couldn't be sweeter: less stress, fewer sleepless nights, better health, and an attitude of peace that will be a natural draw to the curious frazzled people around you. How do you cope with frustrating situations that challenge your patience? How do you teach patience to your children? Margins and slowing my pace of life down have both helped me to reduce stress and be more patient. Knowing I have extra buffer time if something goes wrong makes all the difference! And working as a piano teacher with tons of stressed, over-scheduled moms and kids has led my husband (who is a guitar teacher) and me to choose a slower pace and really enjoy the things we do instead of letting American culture dictate how busy we are. No kids yet, which is a huge factor, but we want to do everything we can to keep family life calm and unhurried when that is possible! Meditation can absolutely be a life-saver for some individuals. Glad to see it placed as #1 on this list!